Outline - Jan 11, 2003. 1. Harmonic Inclusiveness (sometimes called fractality ) -which is how many different frequencies at once you can "invite" into your heart (Heart Rate Variability / HRV) clearly predicts resistance to MOST known chronic disease! (Ref 1. soulinvitation.com/dardik , Ref 2. soulinvitation.com/hrv ). This is one of the reasons HRV is one of the most intensely studied fields in medicine today. 2. HARMONIC INCLUSIVENESS MAXIMIZED BY GOLDEN RATIO: The mathematic solution to maximizing the number of different wave lengths that can share space non-destructively is THE GOLDEN MEAN RATIO - This is the principle of PHYLOTAXIS - the branching geometry of all biology - so named because it is based on PHI - the symbol for Golden Mean. What is perfect UNPACKING for plants, is also perfect packing - hence clearly the Heart solves the problem of sustainability by learning to PACK (compress charge) well. The CEPSTRUM (Coherence Measure) from the HeartTuner screen (not available in any other device). The peak you look at here is the main or first peak on the left side. Each user is color coded, and the newest data is always on the bottom, scrolling up to time history ('waterfall' plot). The height or AMPLITUDE of that first peak is the COHERENCE measure. The peak rises every time the heart has more harmonics in phase with each other. This measures how many waves the heart has found a way to get into AGREEMENT at one time. The skill to produce 'agreement' - coherent centering phase lock - among waves - as it shows up measureably in the EKG- IS the very quantum nature of compassion itself! In practice: this heart coherence clearly rises every time the heart gets coherent - we like to say: " learn to light your own fire - turn your heart from a flashlight into a laser - so your coherent emotion can go far". Watch this peak rise when your body says yes to anything - or you speak your truth, conversely if your body says no to anything if falls. If you learn to watch it, it is indeed a kind of truth detector. This makes good physics because coherence like truth is a wave that is shareable. So the first lesson is to RAISE THE PEAK - learn to light the fire of passion - and sustain coherence. Second lesson: learn to move the peak. Heart Rate Variability richness requires that for health you not ne stuck in one place. The position of that peak back and forth on the X (horizontal) axis measures the musical key signature of your heart - is tied to heart rate. And the ability to move that DOES correspond to emotional flexibility - if your heart music is stuck - so are your emotions. And medical proof exists (Dardik et al) that harmonic diversity (not being stuck) in the heart's music DOES correlate beautifully to resisting most ALL diseases! 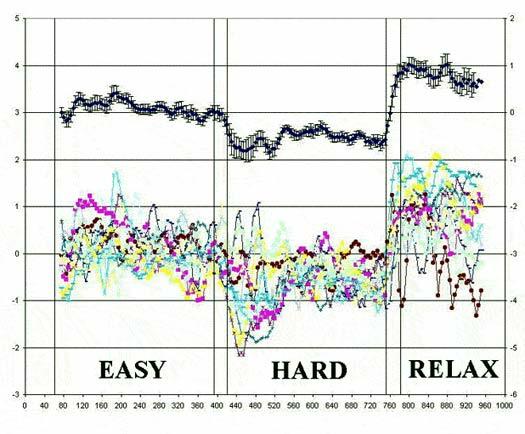 (The is called 'fractal' heart rate variability). Fourth lesson: when the peak is near to 1.0 on that axis - the QUALITY of the emotion is called 'membrane making' - in practice it means that this area is usually your conceptual - head centered kind of feeling state. 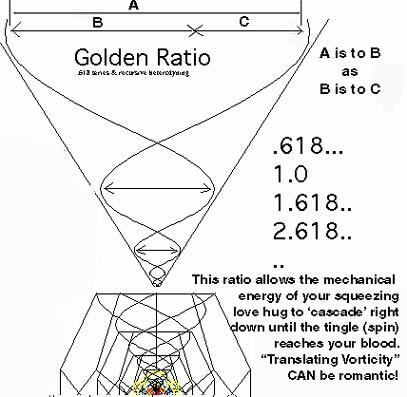 Whereas - when this peaks is nearer to .618 Golden Mean, the QUALITY of the 'emotion bridging' - in practice this is a feeling state usually associated with compassion, empathy, openness - even love. This is because the simple geometry of the heart's electricity moves from isolating / insulated cubic lattice - to embedding and nesting and touchable pent lattice. It is also true however that it is not good to be totally in one or the other, but rather to learn flexibility and even control of your emotion - self-empowerment by feedback. b.) dynamically and continuously feed back the musical fundamental to which the ECG is tuned (linked to Heart Rate - called Emotional Index/ EI number). a.) teaching EMOTIONAL coherence - linked to Heart (ECG) coherence - newly made measureable. b.) 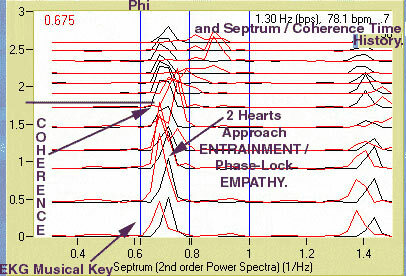 teaching EMPATHY , COMPASSION , MARRIAGE COUNSELING , CONFLICT RESOLUTION , CONCENSUS PROCESS , and ENERGY HEALING by CHARGE TRANSFER - by measuring and teaching the moment at which two persons hearts (ECG) come into perfect musical phase lock. c.) since the same feedback system allows measuring EEG COHERENCE - a revolution in the treatment of Attention Deficit and Addiction is becoming evident. ( ref. 1: soulinvitation.com/braintuner , ref.2: soulinvitation.com/rainbowserpent ). Also the HRV curve on the HeartTuner - becomes a graph of the breathing - and can measure and teach the entrainment of breath to heart to brain..
and 2. onset of Heart Coherence in PHASE LOCK (Heart-Brain LINK UP) with EEG Brain Coherence. (Internal Brainwave Coherence has never before been quantified - and is strongly hypothesized to correlate to attention density - and focus - providing new keys to simplify self-empowering neurofeedback to eliminate Attention Deficit and Addiction.) ref 1., ref 2. 5. Having observed the musical key (heart rate fundamental) of tens of thousands of ECG, it has become CLEARLY evident that most stable heart rates stabilize at one of 3 points ( see 3 blue lines on the CEPSTRUM (septrum) coherence graph time history above. The 3 stability points are Golden Ratio (.618) , Square Root Golden Ratio (.79) and 1.0. Interviews with many thousands of users strongly evidences a psychological correlate to these obviously biologically preferred fundamentals. Those stuck at 1.0 hz musical key - are invariability experience more touch inhibiting - barrier making emotion. VERSUS those at .618 regularly evidence more TOUCH PERMISSIVE emotion. This has PROFOUND implications for cancer ( ref: soulinvitation.com/cancer ) - as well as the simple ability to help people move from 'head' or conceptual based emotions - to 'heart' or touch / feel based emotions and back. The REASON that harmonic inclusiveness - which HeartTuner repeatedly evidences is correlated with compassion - feeds the immune system is simple: Biophysics ("Structural Stability and Morphogenesis" book) concludes that biological membranes sustain TO THE EXTENT THAT THE WAVE HARMONICS WHICH BRAID THEM LIKE A SOAP BUBBLE FOLDED - ARE MUSICALLY PHASE COHERENT - AND INCLUSIVE. 6. 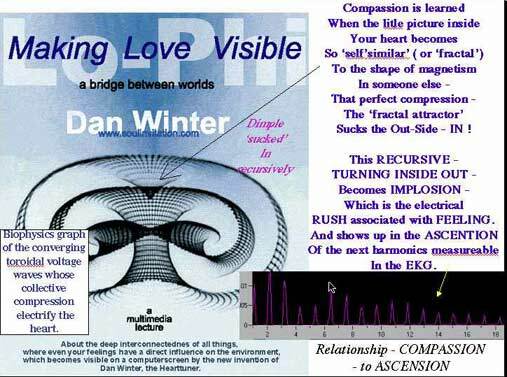 The HeartTuner work provides a vast ground work for now measuring the VIABILITY IN ANY BIOLOGICAL OSCILLATOR OF ANY SCALE - to prove that LIFE FORCE and VIABILITY in general - is predicted by HARMONIC INCLUSIVENESS ! . ( ref: soulinvitation.com/biophoton ) . Information is graphed at that reference evidencing that this can be applied for example to measuring the harmonic inclusiveness of the capacitive charge of ANYTHING ALIVE to measure life force. Transducers (biological capacitance probes) are used with the same HeartTuner to make these measures. Specifically - we discuss why - LIFE FORCE equals the ability to attract and self organize electrical charge . 1. Use HeartTuner in 1 channel mode, reduce noise and wait at least 1 to 3 minutes or so until you have a nice clean waterfall of coherence (Cepstrum) measure (bottom left). 2. Observe where the main peak settles in a pattern. Have your subject quite relaxed and not moving. 3. You place the object to be tested on their heart or solar plexus (they don't move). If their body likes it the coherence peak (main or first primary peak of the Cepstrum) will rise within about one half to 2 seconds. If not it will fall. It is that simple! It works amazingly well. It is important to learn to watch the peak immediately in the second or so after you place the test substance in their field. To get some simple baseline - after you have quiet background - try a really fresh piece of fruit or egg in their aura to see it rise - then try a bag of sugar or something heavy metal or transformer or battery in their aura to see it fall. .. This is a good time to click 'Settings' in HeartTunerPro, 'Enable' averaging (try a 5 second window).. See the effect of your medicine or chosen test substance on your Heart Coherence - 5 seconds with, 5 without .. averaged & displayed dynamically. - spectral analysis of the 24-hour record to compute HF, LF, VLF and ULF components, the periodgram sampling should be the same as for the short-term analysis, eg 218 points. See Figure 7 in the article too for the recommended 'strategy for obtaining the data for the HRV analysis'. Is this relevant for the HT? Heart Rate Variability's Most Profound Power to Heal Lies in Teaching Conscious Control. Harmonic Inclusiveness (Medically Shown to Limit Chronic Disease) In HRV Can Be Achieved Sustainably ONLY IF That Skill Is Consciously Learned. (The Medical Model - let the doctor fix it for you - is the least sustainable - most dis-empowering). Conscious Learning Requires That the Feedback Rate To Teach It - Is Fast Enough So A Conscious Connection Is Made Between The HRV Success versus the Emotion That Produced It. 5 Minutes of Averaging May Produce Slightly More Resolution In the Display of the HRV Power Spectra - But Paying the Price For That Slightly Added Resolution - the Elimination of the Real Time FEEL to Consciously TEACH HRV Health - IS Unnecessary.. The HeartTuner state of the art preamplifier is really a 4 channel - opto-isolated battery powered UL/FDA approved device. It is set up to process 2 ECG channels simultaneously. The HeartTuner design is specifically optimized to provide feedback to the user IN TIME TO ALLOW THEM TO TAKE IMMEDIATE INTERNAL ACTION to change their own heart. This is much different than most HRV systems - whose function is more for later diagnosis - and as a result the HeartTuner experience is probably a revolution in self-empowerment. Specifically - the HeartTuner offers accurate HRV spectral information as close to real time as electrically possible. This provides the service of allowing the person to adjust their breath and heart rate almost real time - in response to screen biofeedback. The quickness of the time to feedback allows a yogic kind of breath control for example to be learned dynamically - with true almost immediacy of feeling to the feedback. (Sufficient for example to allow the above kind of caddeuceus breath to be learned looking at heart beat interval). The number in the lower left of the screen - changing constantly - is the number of samples waiting to be analyzed in the buffer - note that for most even moderately slow computers this number will generally be under 20-50. Since the HeartTuner's digital sampling rate is 120 samples per second - if you divide this number by 120 - you can see that the delay to analysis of data usually is under .1 (1/10) of a second. This is not to say the curve drawn in each display box is faster than 1 second from actual event, but it is close. The way the HeartTuner goes about acheiving faster real time display of HRV data is the use of A SEPARATE ANALOG PEAK COUNTER IN THE HARDWARE PRE-AMPLIFIER to measure the beat to beat interval time. (The extra 2 channels of the 4 channel device looking at only 2 signal sets). - the analog circuit determines the timing of the beat peak with an accuracy much greater than even the 1024 point 5 min recording strategy in the question above. - the computer CPU is completely saved the speed penalty needed to do power spectra of data samples windowed for at least 10 -20 seconds normally needed to see an HRV with an accuracy down to .1 (1/10) hertz. (that would be a supercomputer job to analyze 20 seconds at 120 samples per second in an FFT array). So - in summary - the HeartTuner does a form of the FFT (Fast Fourier Transform) (generally a non-parametric technique) of the Beat Interval plot to display the HRV spectra in Hertz - complete with a time history waterfall display of the curve. The HeartTuner basic sampling rate is 120 samples/ sec. for the regular power spectra display offering fast coherence training feedback. However - the HRV spectra display is not based on that sampling rate - but rather the accurate timing of the beat peak intervals determined by a special state of the art separate peak counter. Then the time in seconds between those peaks is plotted - and those times are taken into an FFT of about 50 peak counts (30-50 seconds roughly) window to then plot the HRV spectra. The HeartTuner's averaging window is then MUCH less than 5 minutes for the HRV display - because while a doctor might want to know how stable the average was - the USER - cannot make the connection between CHOOSING A FEELING and seeing the result - if that result takes 5 minutes to get to the screen. That is why the HeartTuner's accomplishment to get HRV info on the screen MUCH closer to real time than most doctors could imagine - is both revolutionary and self-empowering. As such the above medical literature discussion of what makes good HRV display is actually the OPPOSITE of what it takes to make an HRV display self-empowering to a user who wishes to take control of the relationship of their emotion to their health! 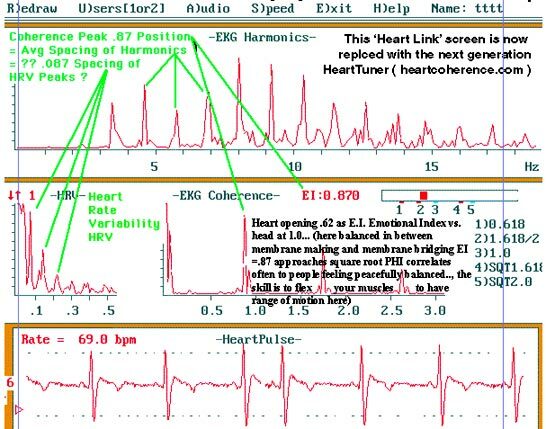 In the view of this inventor of the HeartTuner - this is indicative of the medical tradition for dis-empowering the patient - failing to recognize that the real meaning of HRV is for the patient to discover the connection between CHOOSING COHERENCE and CHOOSING HARMONIC INCLUSIVENESS by INTELLIGENT EMOTING. The nice thing about HeartTuner - is that the 4 separate raw and spectra data files simultaneously exported by HeartTuner - allow anyone with reasonable skill in spreadsheet software like Excel - to plot longer time window averaging HRV for example. Medicine did not know what live blood cell microscopy was - until persons other than traditional dis-empowering doctors - chose to show people their blood 'real time'. Medicine did not know what live electron microscopy was until Raymond Royal Rife - showed microscopy in vivo - better than current 'dead stuff - post mortem only' electron microscopy - in so discovering the energy bases (frequency signatures) of many diseases. The medical ideal to display more detail by averaging HRV data over longer time - is clearly appropriate in many diagnostic situations - for that the HeartTuner provides ready data export. 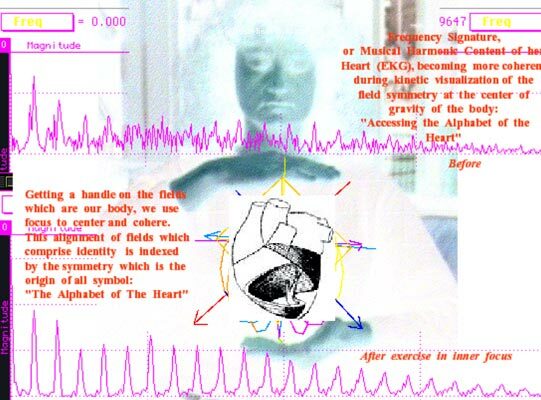 The HeartTuner's primary function to teach real emotional control over heart coherence , and HRV harmonic inclusiveness - is unparalleled anywhere - and clearly cannot be measured by statistical techniques (implied in the above referenced medical article on how to take an HRV) SPECIFICALLY DESIGNED TO PREVENT A USER FROM SEEING HIS OWN HRV FAST ENOUGH TO EMOTIONALLY REMEMBER WHAT THE FEELING WAS THAT MADE THE PLOT. The HeartTuner does not do Standard Deviation of 5 minute histories of HRV. Altho 5 minute averaging of heart coherence IS possible ON SCREEN by setting the ceptrum averaging window on in the settings options. Of course Standard Deviation (SD) can easily be offered from the data files exported - in later processing. 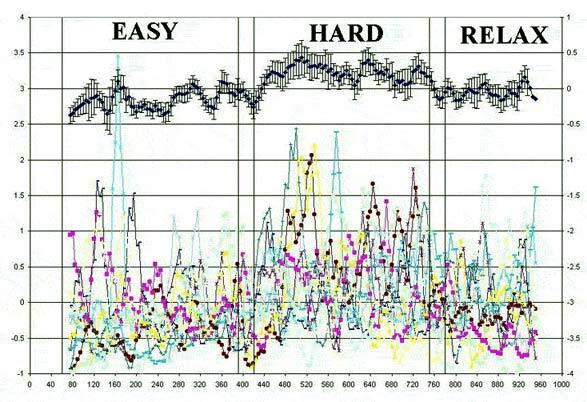 Note figure 7 in the referenced article describing ideal HRV data taking procedure is obsolete and irrelevant to the use of a separate analog peak counter to accurately measure the milliseconds between peaks faster and more accurately than even high sampling rate Analog to Digital sampling. Septrum Peak x-coordinate (Emotional Index) is lower during difficult tasks and higher during relaxation. What exactly does the Emotional Index tell us about our state of mind? Figure 2: Septrum peak amplitudes - higher during difficult, frustrating tasks. - Top Plot - AVERAGE of Subject Pool for Septrum (Coherence?) Peak - Vertical Axis - Power Density - Horizontal Axis - Time During Which Tasks were uniformly sequenced.